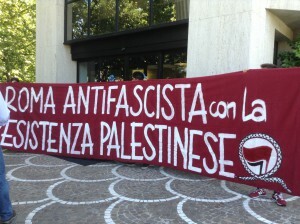 On August 5, a group of anti-fascist activists in solidarity with Palestine paid a visit to HP headquarters in Rome to denounce the computer company’s complicity with the occupation and apartheid policies that the State of Israel has been imposing on the Palestinian people for 66 years. HP’s complicity includes providing identification systems for Israeli checkpoints, computer hardware and software for the Israeli army and navy and manufacturing biometric ID cards used in profiling Palestinian residents of Israel. The date also marked one month since the beginning of Israel’s bombing campaign on the population of Gaza, a month in which people all over the world have been demonstrating in solidarity with the Palestinian resistance, including direct actions and boycotts. 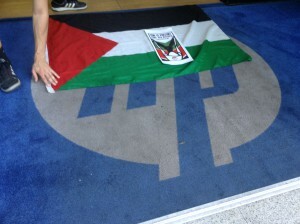 In Birmingham this morning activists occupied a factory of the Israeli weapons manufacturer Elbit and in Italy a campaign was launched to boycott HP products, including computers, printers and scanners, until the multinational company interrupts all ties with those who oppress, kill and imprison the Palestinian people. A month of incessant bombing, a massacre of incalculable proportions. In addition to the number of people killed or injured, and the disaster and destruction that will continue to take form long after the drones, naval ships, tanks and fighter jets cease tormenting and cutting short the lives of the Palestinian people of Gaza, Israel’s siege and settlement project will continue in “low intensity” mode, passing below the radar of the international community. It is, in fact, from the everyday violence and harassment of Zionist colonial expansion that Hewlett-Packard turns a profit, providing computer systems to the Israeli Defense Ministry and technologies for control of movement at checkpoints in Gaza and the West Bank. HP equipment is supplied to the Israeli prison system and the military, as well as being used in the technological development of settlements, for example, with the “Smart City” project in Ariel. One can only wonder what they tell the people working in locations such as the offices in Rome, for a multinational company that uses technology and knowledge to supply a military engaged in 66 years of massacres and ethnic cleansing. Today we are here to disturb the normalcy with which Hewlett-Packard profits from the Israeli economy of war and oppression, encouraged by the many initiatives just like this taking place all over the world, including the occupation in Birmingham, UK, this morning of a factory of the Israeli weapons and control systems manufacturer Elbit. 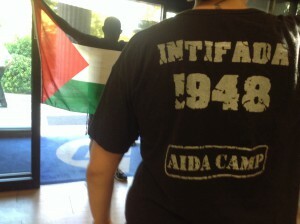 Since 2005, the Palestinian people have called on all those who refuse to be complicit, in silence, with Israel’s system of Apartheid and military occupation of Palestine to act. The call for boycotts is resonating in the conscience of thousands of people, who have stopped buying Israeli products and are informing others, causing economic and reputational damage to those companies that choose to “endorse” Israeli oppression. 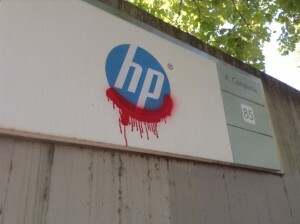 The “HP” logo is starting to be seen as something to be avoided or replaced by hundreds of other brands. We will continue to call for boycotts of all Hewlett-Packard products until the multinational company interrupts all ties with those who oppress, kill and imprison the Palestinian people. 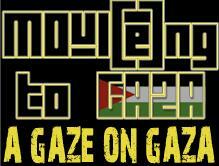 With Gaza and all of Palestine in our hearts. 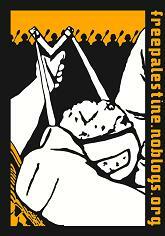 This entry was posted in Gaza, General. Bookmark the permalink.